Yesterday the issue of the Buddhist magazine, Lion’s Roar, arrives. Later I will find inside a wonderful article on Bernie written by Deputy Editor Andrea Miller. For now I put the magazine aside, but my eye keeps glancing at the cover, where, in small letters on the left, are the words: Remembering Zen Mensch Bernie Glassman. Bernie Glassman is in bold, but the letters seem to back away from me. I don’t know them and they don’t know me. At the same time, they’re a big distraction. The magazine lies at the corner of the desk, away from my computer, but I keep on looking at that cover, at the words, and finally just stop what I’m doing. Harry the Cur sees an opening and jumps up, front legs on my lap. Ordinarily I’d make him go back down. Instead, I pet him absentmindedly, thinking irrelevant thoughts like: Why do they use such odd photos of Bernie? Of course, the old ones of him in Chiapas, at Greyston, in Poland, are classic. But the ones that just catch his face always seem to be off to me. That’s when I realize that I can’t look at photos of him all on his lonesome. I can see photos of him teaching in a crowd, on the streets, fooling around with his grandson. Not alone. It’s hard to read a story of Bernie’s life, even when it’s pretty comprehensive and well written like this one. The story of his life is not much different from the photo above, when we used to write up his daily schedule every morning. It says something, and it says nothing. Funny, coming from a writer. And one who wrote more stories about him (and attributed to him) than anyone else. Bernie knew the value of a good story. He had a talent for providing the content that every newspaper person wants, the perfect quote. We didn’t talk about it, but I’m sure he knew what made for good copy, that in fact he was good copy, that he made for great photos with his beret and cigar, the unkempt Brooklyn look. Once his Japanese teacher died, no shaved head and robes for him. But he also saw through stories all the time, didn’t believe a word, especially after the stroke. He might do an interview on Zoom, and when it was over he’d ask, “Was it okay?” He knew his thoughts came slower and his speech was more laborious. Stories were upayas for him, skillful means to make this point or that point. They weren’t real, they were stories, once-upon-a-timers. If they weren’t useful, what good were they?. 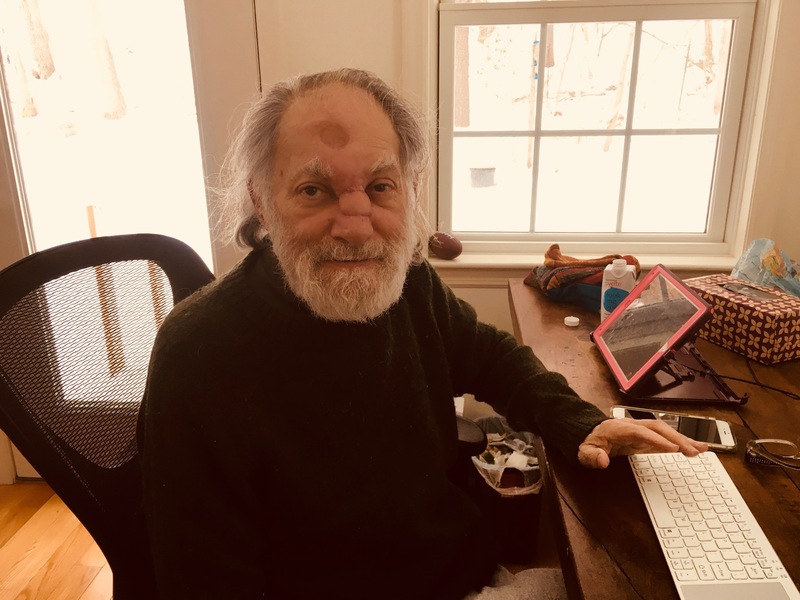 I have lots of photos of Bernie after his stroke, and it’s hard for me to look at them, especially those showing the wounds on his forehead and the top of his nose from his cancer, like the one below. It was carcinoma, not the worst cancer by any means, but one that was still dangerously close to his brain. As I look at them it hits me how he never minded being photographed with them, even when they were big protuberances, raw and ugly. For him, they were also stories, no different from photos of him on the streets or teaching or clowning. If people, like me, prefer the latter over the former, well, that’s people. Friends nod and say, “You miss him.” If I were to reply, I might say: How do you miss someone who’s so inside you? The one has to become two for A to miss B. Occasionally there’s a creaking, as if the two are slowly and painfully coming apart, like chemical elements disengaging one from the other. And of course we were so different one from each other, with unmet needs and provoked reactions, that’s no secret. It’s not that after death all that disappears and you remember just the good stuff, nothing as facile as that. It’s just that the two are still entwined, even embedded. Remembering Zen Mensch Bernie Glassman. I don’t remember a thing. It’s just him/me looking out at the white yard, so self-revealing, so simple. < Previous THAT DOG DON’T PLAY!